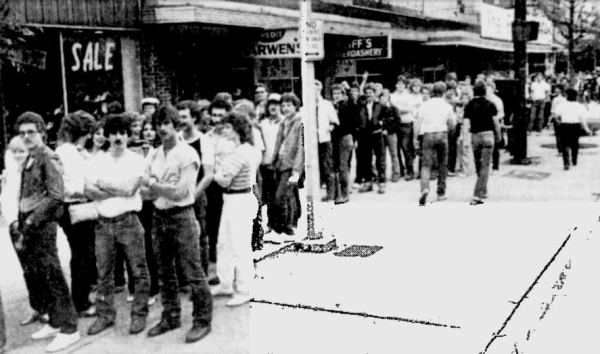 Above is a picture that appeared in the Vindicator of people waiting to get into a Donnie Iris show on May 20, 1983 at the State Theatre and Civic Center (formerly the Agora and Tomorrow Club). It was the first show for the newly renamed venue which jettisoned its links to the night club days in a return to a style closer to that of when it was a movie house. Nick Behanna, a Warren businessman, leased the theater at the time and had plans to bring it back to its former grandeur. There was even a mention of refurbishing the projectors and showing classic movies. On June 29, a boxing show was scheduled to be held at the venue, but it was abruptly canceled right before showtime in embarrassing fashion. It would seem sometime in mid-July the State Theatre and Civic Center experiment was over.